Hello all. 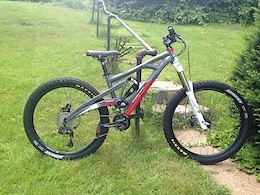 I'm putting this bike up for sale because it has rarely seen use for at least the past year. I have done a few upgrades to the bike over the time I've owned it. These include: Spank Spike 777 evo bar and 50mm stem ODI Rogue Grips Maxxis Ardent 2.4 exo tires front and rear WTB Speed V saddle Cut down seatpost Odyssey Twisted PC pedals 200mm rotors front and rear Removal of 44t chainring from original cranks, replaced with a raceface bashguard The rest of the bike is stock, and you can find the rest of the information here: http://www.marinbikes.com/ww/bikes/description/2012-attack-trail-6.8-int Please keep in mind that this is a size Small frame, meaning it is typically better suited to shorter riders. I'm approximately 5'6" and it fits me pretty solid. There is only one issue worth mentioning, that being the squealy disc brakes, though I intend to have that fixed before anyone takes the bike home with them. If you have anymore questions, or a reasonable offer, go ahead and contact me and I'll do my best to answer them. Is there a place to grab one of those 'Forever a Legend' shirts? 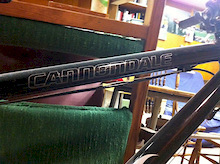 This is a medium 18.5 in 2005 cannondale f1000 aluminum hardtail in very decent condition. Used but never abused. medium cannondale hardtail aluminum frame Lefty speed fork with rebound and lockout adjust 110mm (~4.3 inches) of travel Mavic 819 disc wheels front and rear Avid juicy 7s SRAM x7 shifters SRAM x9 rear derailleur Shimano lx front derailleur Truvativ stylo cranks 44-32-22 9 speed rear cassette 11-34 Fizik gobi saddle Fsa fr270 handlebar 680mm with odi ruffian grips No calls please. I probably wont call you either. use pm on pb or email me. Someone ought to make ceramic brake rotors like for WC downhill. ahh, no worries dude. I'm just tryin to get into the gravity game.